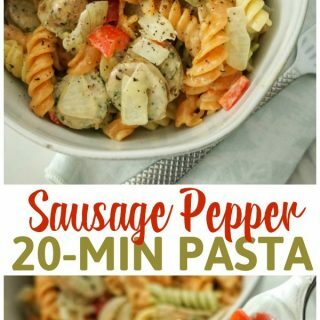 This easy Sausage Pepper Pasta is filled with flavor and perfect for a filling dinner in under 20-minutes or great as a warm or cold side pasta salad dish for parties and gatherings! Cook pasta, following package directions, to al-dente. You'll want to remove the pasta from the stove when it is still just a little hard as it will continue to cook with the sauce. Heat 2 tbls of olive oil into a large frying pan. Add diced sausage, peppers, and onions. Saute until the sausage is browned and vegetables have softened. Strain pasta with a slotted spoon, reserving about 1 cup of water in the pot to use for your sauce. Return pasta to stove and add 1 tbls chicken base (or 2 bouillon cubes), heavy cream, and garlic paste. Add in sauteed sausage, peppers, and onions. Stir to combine well and allow to cook for a few more minutes, or until sauce has thickened. Serve warm or chill and serve cold as a side dish.